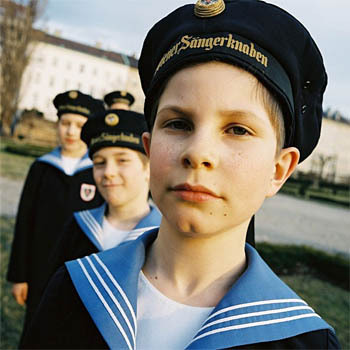 Vienna is known as the City of Music, and no guide to it would be complete without mentioning the Vienna Boys’ Choir. This group, called Wiener Sängerknaben in German, is older than the Austrian Empire, yet has changed and grown throughout the years to reflect the times. The illustrious history of the choir is inexorably tied to that of Vienna. It was famously founded in 1498 by Emperor Maximilian I as a group of court singers, making it one of the oldest choirs in the world. Its imperial patronage fo stered high standards, and put it at the forefront of the European music scene. It has long since been known as a source of world-class talent, from musicians to vocalists, featuring Mozart among its former members. Surviving with the city throughout war, siege and plague, in 1924 it was reformed into the choir that we see today. This modern choir is a not-for-profit organisation that is as international as they come: not only do they perform music collected from around the world, but its members are chosen from all over the globe, from at least 11 countries spanning 4 continents. This openness to diverse membership is set in the choir’s aims – an impressive collection of musical and social goals. They will take boys from any background and seek to educate them into well-rounded human beings; music is the medium for providing the choristers with diverse experiences and the opportunity to contribute to culture. However, it is not easy to become a member of the choir, as there is a rigorous selection process. The lucky 100 sopranos and altos, aged between 10 and 14, who are chosen are sorted into four touring choirs. Each is named after a great Austrian composer – Bruckner, Haydn, Mozart and Schubert. Schubert was another composer who worked with the choir, on pieces that they still sing today, although their range extends back to medieval and through to contemporary and even experimental music. The tours go to North America and Asia, where the choir continue to add international music to their collection. The boys are symbols and ambassadors of Austria, winning new fans through the universally understood language of song. When they are not touring, the boys live, study and rehearse at the Palais Augarten, where the choir has been based since 1948, when the building was given to them by the government. Their concert hall is MuTh (Musik and Theater), where they give regular performances of all kinds. As of writing, they are scheduled to perform Japanese music and Schubert. If you wish to see them in a more historical setting, then you may prefer to attend Sunday Mass in the Imperial Chapel. The building itself is impressive enough, and has the intriguing feature of being set out more like a theatre than a church. Attendees are also given an opportunity during the Mass to take photos of the choir. For more information on performances, the choir has an up-to-date schedule on its website, which is in both German and English. Their website also contains fun trivia (for example, they sang during the intermission of the Eurovision Song Contest in 1967), and a souvenir shop which sells chocolate and rubber ducks alongside CDs! The choir has already recorded many CDs, and there is a new one planned for release this year (2017). Their fame has also attracted documentary makers and filmmakers alike; they were the stars of the Disney feature Almost Angels/Born to Sing (from which time they were legally allowed to wear the national emblem of Austria on their distinctive sailor uniforms). There is also a newer film that gives a glimpse behind the scenes of the choir’s lives on tour, Bridging the Gap. There are many ways and many places to experience this amazing choir in action, but nothing can exceed a live performance in their home city. Where better to feel their history, which has made the choir the talented and diverse one it is today? If you have the opportunity, take it – this choir truly is an essential part of any visit to Vienna.